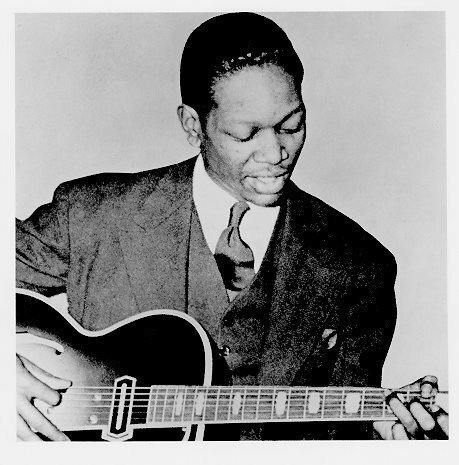 Gone With “What” Wind is another riff-based composition – a typical fast blues by the sextet with very good solos by Charlie Christian; his solos are about as blue as you can get at this tempo. The tune has nothing to do with the immensely popular movie that had just been released a couple of months earlier, other than to capitalize on the title. Six versions of this tune were recorded: four with the sextet, one with a quintet, and one with the later septet. 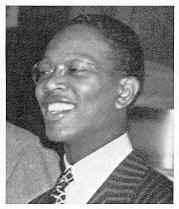 An assiduous day at the Columbia recording studios: following the Metronome All Stars session, the Goodman band recorded three selections before the sextet gathered to record two tunes (Till Tom Special was the first) with Count Basie invited to the piano bench in Johnny Guarnieri’s stead and Charlie Christian and Lionel Hampton stepping up to their usual posts. On this initial take, Charles plays some untypical phrases across mm 5 and 6, and again on first half of bar 7. After the guitar solo, we hear wonderful CC comping on following 4 choruses, especially behind the vibes solo. Charles’ first set of riffs is reminiscent of the 4-bar break introduced on the studio version of AC-DC Current a month and a half earlier. With Basie still on piano and Hampton on vibes, this master take is taken at a more relaxed tempo than on the previous take. 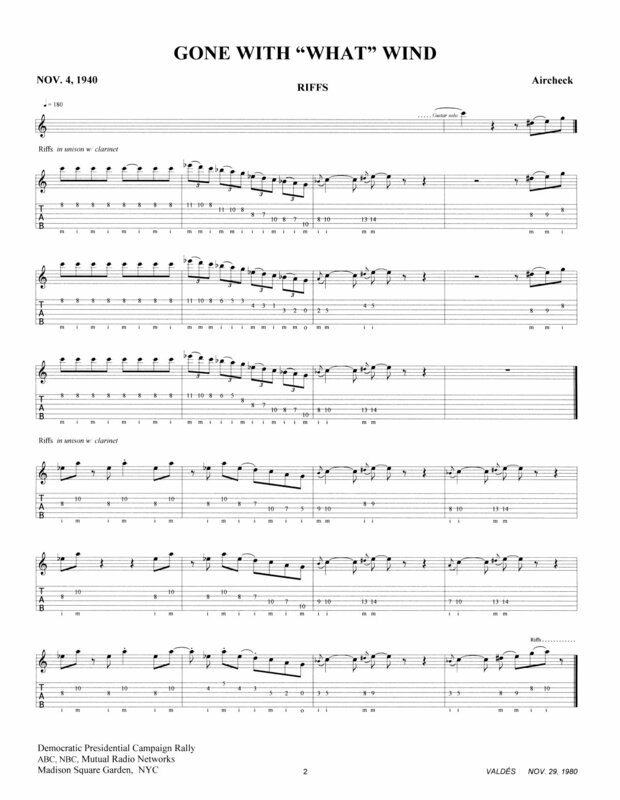 Interesting play of repeated ♭7/13 (F/E) on the G7 sequence at mm 9-10 of the guitar solo. Also note the two pre-bent notes on the 10th fret at bar 12. To complement the previous G7 sequence, we get a less elaborate ♭7/13 (E♭/D) cluster on the F7 across mm 4-5 of the second chorus. After the guitar solo, CC adds his very special touch of impetus with impromptu riffing behind the vibes solo; he goes into straight comping on clarinet solo. 3 March 19, 1940 “The Cocoanut Grove” Ambassador Hotel, L.A.
After the February 7th studio recording session, the band went on an unrecorded 3-week tour to Pittsburgh, Indianapolis and Chicago, then took a 2½-week break before heading to the West Coast to begin a 6-week engagement at The Cocoanut Grove where the very first tune the sextet recorded was Gone With “What” Wind. Guarnieri was back in his piano chair and Hampton was still on vibes. On his solo, Charles hints at blues stuff at bars 6-7, then gets much bluesier at mm 9-10 vexing the ninth of the dom7. On his second chorus, he uses a lot of vertical fretwork to make his familiar lines sound even blue-er than usual. 4 April 6, 1940 “The Cocoanut Grove” Ambassador Hotel, L.A. Still at “The Cocoanut Grove” with the same pianist and vibist, but at an even faster clip. Charles’ solo: Crossing mm 4 & 5 we get a hint of the cascading riffs forthcoming in the first set of riffs after the solos. At bar 4 of the second chorus, Charles starts a four-bar sequence that he more often used on the bridge of a standard tune, then ends the run on mm 7-8 with another example of his clever use of the sustained open string. The last four bars of the solo are an abbreviated repeat of his last four-bars of the first chorus in the master take of this tune two months earlier. Co-composer, Basie, is once again on piano. The band had taken a three-month summer break after their West Coast tour and was still in the process of getting re-established when this gig presented itself for the ad-hoc quintet consisting of CC, BG and most of the Basie rhythm section – Basie, Page, Jones – all five had participated in the renowned octet rehearsal session at the Columbia studios a week earlier on 28 October. The piece is played at a slower tempo than on prior sessions. 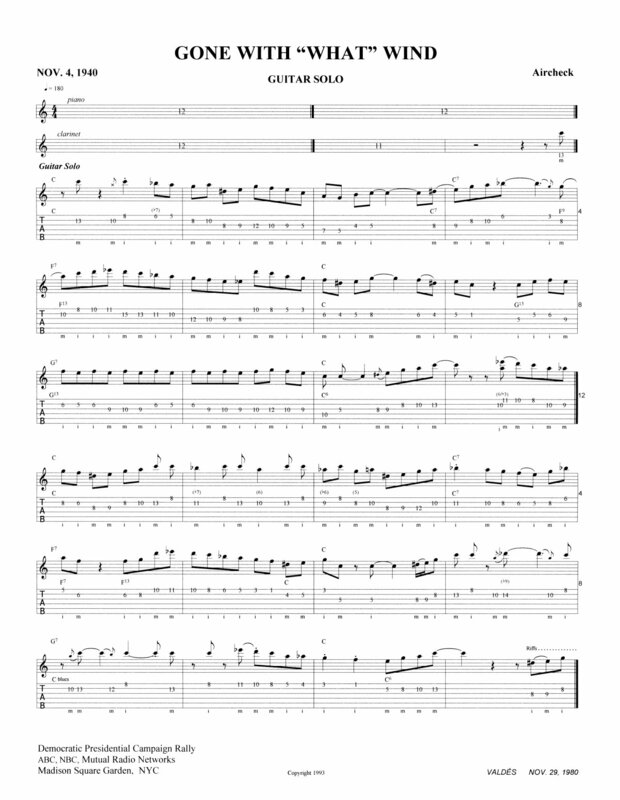 As on the master take we again get the repeated ♭7/13 (F/E) sequence on the G7 at mm 9-10 on the guitar solo. On the second chorus we get some more vertical blues-work (as on 19 March) up and down on one string. On this version of Gone With “What” Wind, Charles continues to riff for eight more bars after the usual three shout choruses – an additional bonus for the CC fan. This political rally was held the day before Election Day in support of the President’s re-election. Although FDR had addressed the rally at Madison Square Garden on 28 October, he was not in attendance at this MSG rally but he did get the opportunity to shake CC’s hand on another occasion. This final version of Gone With “What” Wind is from the “America in Swingtime” radio broadcast which had not been publicly available since its original broadcast in 1941 – it was finally released in 2001 on the Encore label, the only CC tune from that broadcast. Slower tempo again; Guarnieri is back on piano, Cootie on trumpet, Tough on drums – this is the later septet now. Auld is here but doesn’t solo on this tune. Charles starts out very laid-bad, plays some standard lines until bar 8 where he gets really funky. The second chorus starts out with a C6/9 including a ♭3, transitions with an Fm6 into an elegant run (C/C13/F9) normally found on a non-blues tune. Still on the F7 section, Charles throws in a quick ♯11, ♭7, 9, 13 arpeggio in bar 6 before leveling off into the C where he stays (except for an F7 for a couple of beats) till the end of his solo. Measure 9 of the second chorus has a sequence that mimics the repeated ♭7/13 sequence found on some of the other versions of this tune but these are just tonic/3s with the 3 moving up chromatically to the 5. 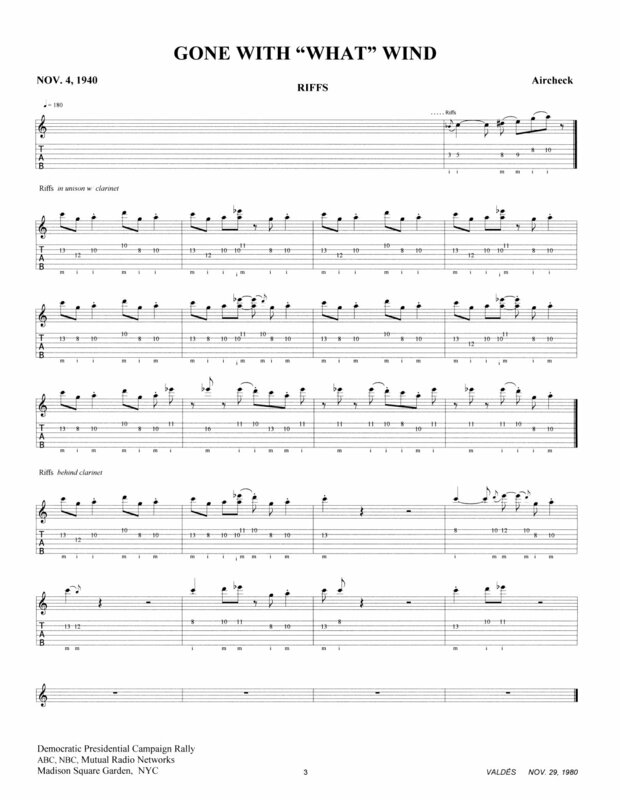 As on the previous version, this one also has guitar riffs on the last chorus – this time for the entire chorus.